We are tired of backing up iPhone with iTunes or iCloud, because it's too complicated for us to operate and also we're restricted a lot when backing up via iTunes or iCloud. Thus we are looking for a better way to backup and restore our iPhone data easily. This article will guide you how to backup and restore iPhone data simply for free. Syncios iPhone Manager, a professional mobile managing tool, has worked for iPhone data backup and restore for years. It supports backuping and restoring any iPhone, including iPhone 7, iPhone 7 Plus, iPhone 6S Plus, iPhone 6S, iPhone 6, iPhone 5S, iPhone 5C, iPhone 5, iPhone 4S, iPhone 4, iPhone 3GS. And you are allowed to backup and restore iPhone contacts, messages, photos, videos, e-books, notes, bookmarks, call histories for free. Step 1: Here we begin to backup iPhone data. Firstly, please download and install Syncios iPhone Manager on your computer. Step 2: Connect your iPhone to computer with USB cable and launch Syncios iPhone Manager. The software will automatically recognize your iPhone. Step 3: Click "Media", "Photos", "Ebook", "Apps", or "Information". After choosing one, from the middle panel you can find the Import, Export, Delete, New option. Just click “Export” to select the location in which you would like to store your files by clicking on that folder. After that, the backup process will begin. Step 4. Click on "Information", and you will see the Contacts, Notes, Bookmarks, Call History and Messages of your iPhone. You will see the Backup option under these icons. Just click this Backup icon, you can backup your data from iPhone to PC. And also you are allowed to edit them via Syncios conveniently. Step1. After backing up, you just need to open Syncios Manager again, and click on Import, Add or Recover ( for items under Information ) to get your backup file back. You can choose add files one by one or add file folder to retrieve them at once. 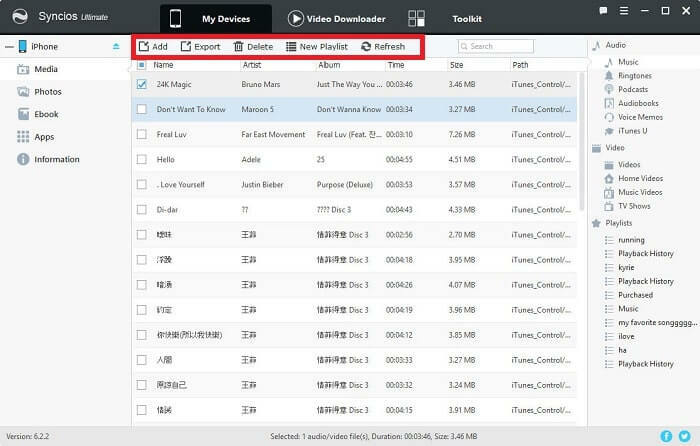 For instance, if you want to restore your songs, then please go to Media and click on Add to import songs to iPhone by finding the previous backup file. 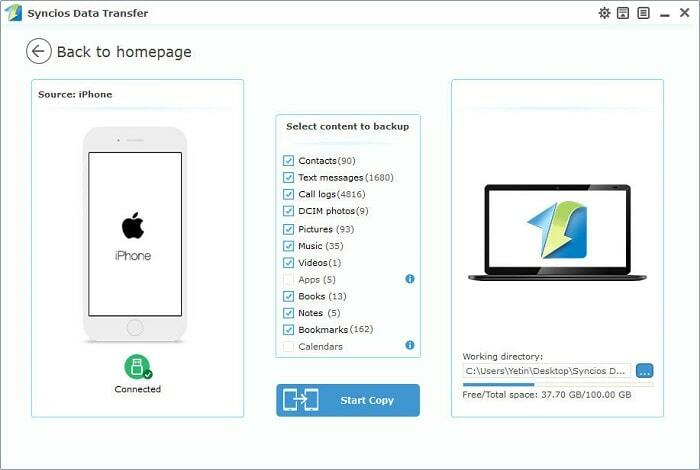 Syncios iPhone Data Transfer support to transfer contents include contacts, messages, call logs, music, photos, videos, notes, ebooks and more to pc or another phone, and can help you to backup and restore iPhone data with lossless quality. Step 1. 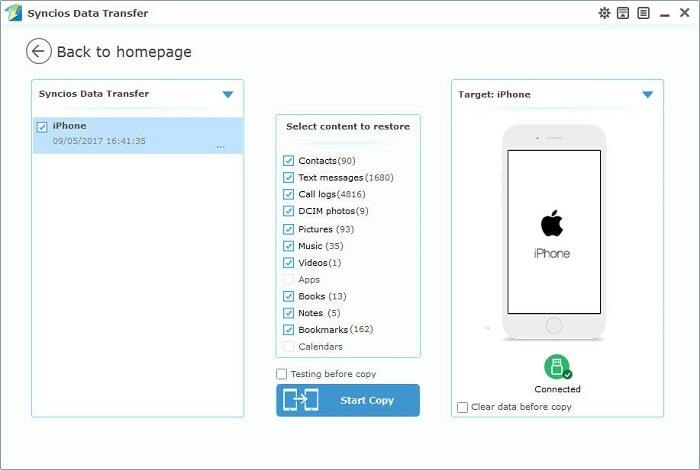 Download and install Syncios iPhone Data Transfer on your computer. Step 2. Then open it and connect your iPhone via USB cable. Please make sure you’ve click “allow” or “trust” on iOS device screen when Syncios iPhone Data Transfer read your data. Step 3. Go to Backup to PC on the homepage. Then choose the items you’d like to backup after data sanning, then click on Start Copy. All of your Syncios iPhone Data Transfer can be saved for a moment. Step 1. Open Syncios iPhone Data Transfer again，then choose Restore from PC on the homepage. Step 2. Choose the previous Syncios Backup File on the left pannel, Syncios will obtain the backup automatically and show them on the middle pannel. Step 3. 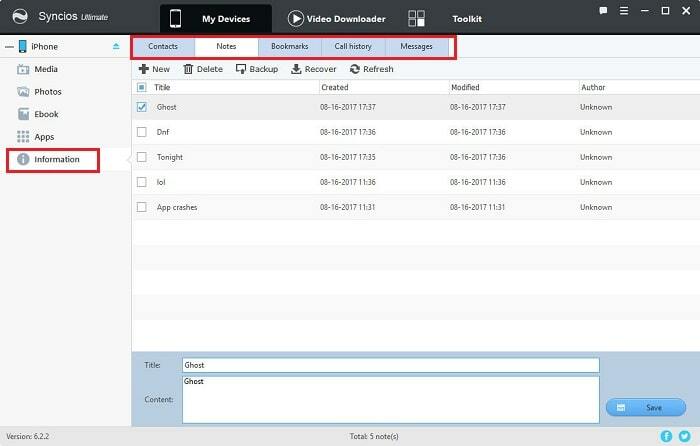 Now tick the items on the middle pannel and click on Start Copy to restore your backup file to iPhone or other devices.